Welcome Music add-on £100 – A set of live acoustic music (approx 30-45 mins), played as guests arrive to the venue before the ceremony. This can be added on to the Wedding Ceremony package or the Wedding Ceremony + Drinks Reception package. Wedding Breakfast add-on £200 – Three live sets (approx 30-40mins each) during the wedding breakfast. This can be added on to the Drinks Reception or Ceremony + Drinks Reception packages. “mini-DJ” add-on £75/hr – Can be booked to follow the Evening Party or Full Packages. This is not a full DJ set up – disco lighting and specialist DJ equipment are not included. I play music through my PA system to keep the party going after my live acoustic sets in the evening. I can mix music/take requests and speak through the microphone, similar to a DJ. A wide variety of music is covered, but probably not as much as a dedicated wedding DJ. This is perfect for smaller evening receptions, or situations where maybe you only have an hour to fill after the live music has finished, but it’s not cost-effective to book a DJ for such a short time. For more information about this service please contact me. Lots of information to take in! 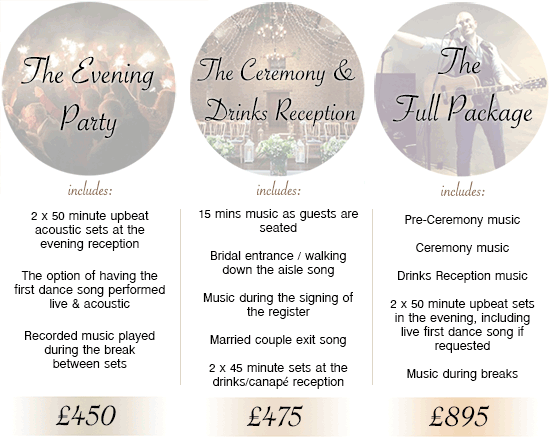 I’m an expert in tailoring the music for your big day… if you’re not too sure which package you’re after, just drop me a line on my contact page, give me as much information as you can and I’ll do my best to guide you in the right direction!